“It looks terrifying.” That’s what my friend Amy said when I opened my jar of homemade mead and poured her a cup to try. 1. Dilute raw honey with water. If you want something more elaborate, you can flavor mead with fruit. Cantaloupe, watermelon and other fruits that rot quickly work well. 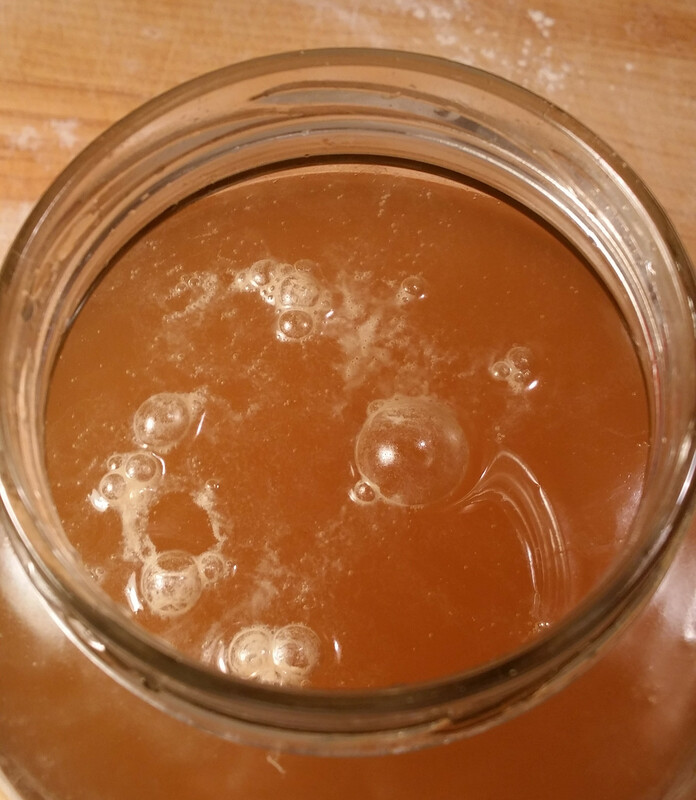 The naturally occurring yeasts in the fruit, like those in the raw honey, fuel the fermentation, transforming glucose (and eventually fructose if you age your mead) into alcohol. I wanted to keep my first attempt simple and foolproof, so I decided against fruit. But I’m definitely making it again—this homemade hooch tastes really good (just ask Amy)—so I’ll add fruit to a future brew. However, you do have to strain the fruit out before the fermentation has stopped. This recipe provides the directions for a simple mead only. Mead involves a bit more than stirring water and raw honey together, but not much! Some tap water contains high amounts of chlorine, which will kill off the wonderful microbes you need to ferment your mead. I try to remember to expose my jug of water to the air for a few hours (or longer) to dissipate chlorine before I ferment anything. I haven’t experienced a problem with chlorine, but do this as an insurance policy nonetheless. 2. Stir vigorously or place a lid on the jar and shake it until the honey–water is combined well. 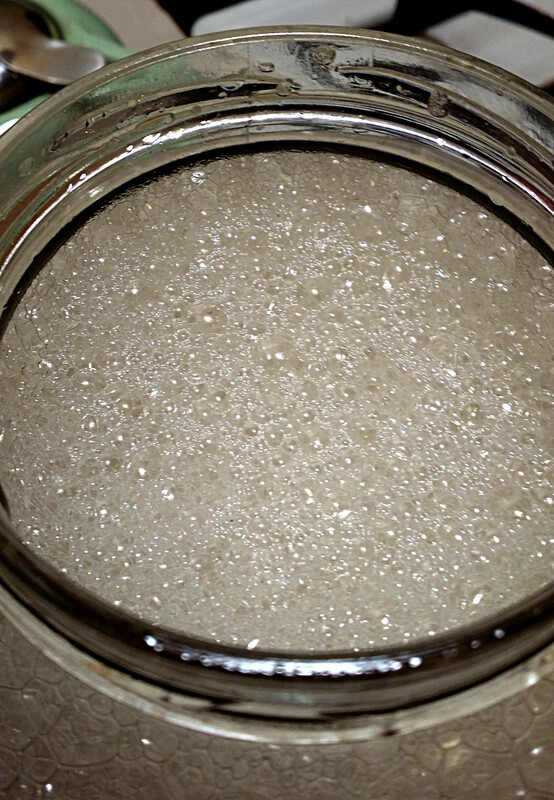 You do not need to expose this mixture to the air in order to attract microbes that will ferment it. 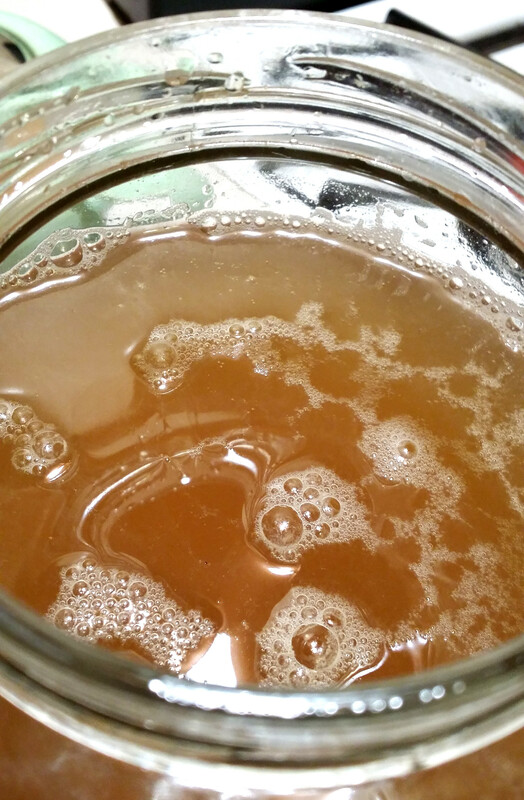 Raw honey already contains yeasts that convert the sugars to boozy goodness. 3. Until your honey–water begins to bubble, stir it vigorously every time you think of it. I stirred mine every time I waited for the kettle to boil for tea—four or five times a day. In the fermentation bible, The Art of Fermentation, Sandor Katz suggests stirring the mead to create a vortex in one direction, then in the other. This aerates the mead-in-progress, which helps spur yeast growth. Opening the jar daily—burping it—also releases built-up carbon-dioxide. BURP YOUR JAR DAILY TO AVOID EXPLOSIONS! 4. 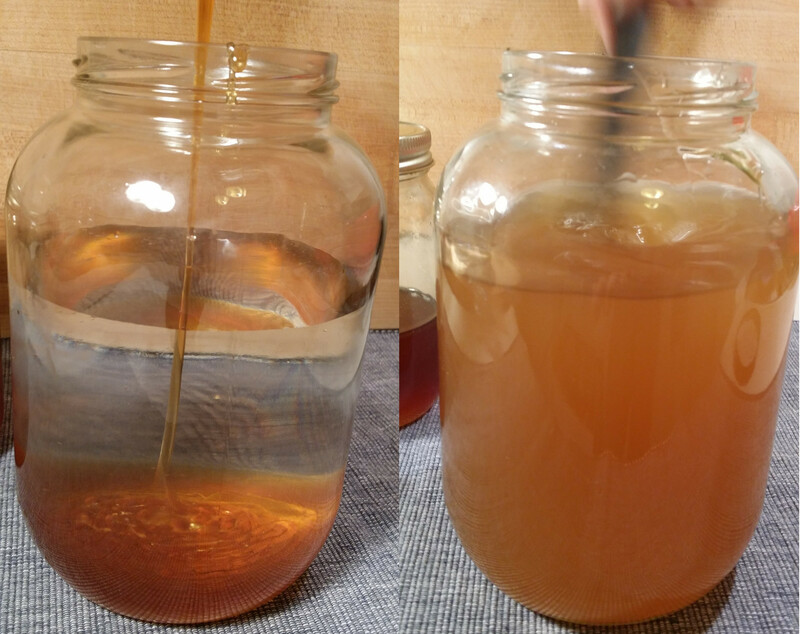 My mead began to show signs of life on day 4 and I was so relieved! I thought it would never bubble. Take a whiff and you’ll notice a definite smell of alcohol. (Microbes are amazing!) Stir it and a foamy head will form. At this point, you can stir your mead just once a day. 5. The mead will foam up like this for a few more days when you stir it. Once the bubbles die down, most of the glucose will have been converted to alcohol. Most of my bubbling action subsided by day 14. Katz recommends beginners enjoy their young, partially fermented mead at this point—as people have in cultures around the world for millennia. You can bottle, rack and age your mead, which will increase the alcohol content, but I don’t have the (rather minimal) equipment necessary for this. If you do bottle your mead, and the fermentation has not finished converting the remaining fructose to alcohol, YOUR BOTTLE MAY EXPLODE! I would rather not have to worry about that. Also I’m a lightweight who can’t handle alcohol much stronger than this. I don’t have the proper equipment to measure alcohol content, but I would guess this is around 5 to 7% alcohol. 6. Optional step: To make more mead using the continuous starter method, reserve 1/2 cup from the initial batch if it still bubbles vigorously. Those bubble indicate active fermentation. Begin with step one of these directions, adding the 1/2 cup of reserved mead to the honey–water. This will kickstart the new ferment and your mead will be ready to drink sooner. 1. Combine honey and water together in a large glass jar. 2. 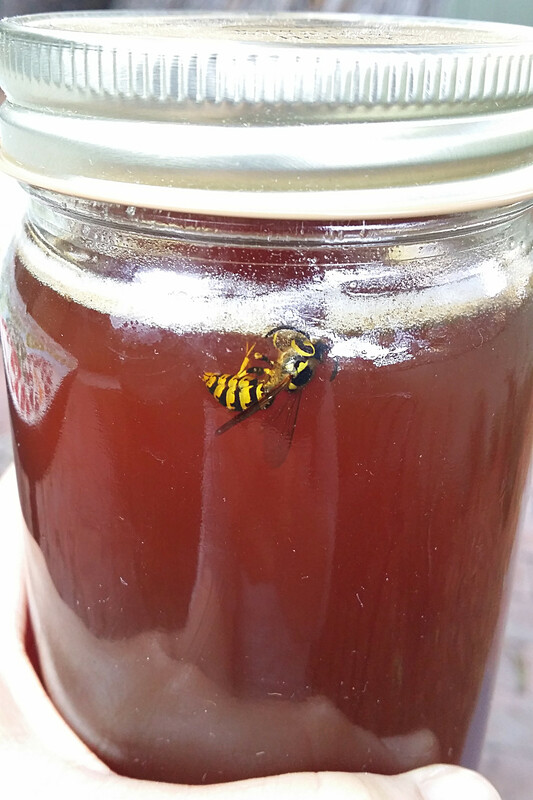 Stir vigorously or place a lid on the jar and shake it until the honey–water is combined well. 3. Until your honey–water begins to bubble, stir it vigorously every time you think of it, several times a day. Opening the jar daily—burping it—also releases built-up carbon-dioxide. BURP YOUR JAR DAILY TO AVOID AN EXPLOSION! 4. Once bubbles begin to form on the surface, you can reduce your stirring to just once a day. 5. When the bubbles begin to die down, sometime between days 10 through 14, the young mead is ready to enjoy. Remember to continue burping your jar daily until empty. 6. Optional step: To make more mead using the continuous starter method, reserve 1/2 cup from the initial batch if it still bubbles vigorously. Those bubble indicate active fermentation. Begin with step one of these directions, adding the 1/2 cup of reserved mead to the honey–water. Wow I didn’t realize it was that simple; that’s pretty cool. Which kinds of fruit do you think you’ll try in it next time? I must try this. I love mead, but never thought of making it myself. I like the idea of using watermelon too. Thanks so much for another great idea. You’re welcome. I’m thrilled I taught you something because you have such innovative ideas on your blog and I always learn something when I visit. I’m pretty sure you have to strain out the fruit before the mead finishes fermenting. I have to look it up and make a note about that on my post. I don’t want anyone to ruin their precious nectar. I was thinking I would strain the pureed watermelon before fermenting, but I’m sure either way works. There are a couple of ways to do it, and which one depends on how you want your mead to taste. The first is to keep the fruit in at the beginning and allow it to ferment in what’s known as the primary fermentation stage. Then, you transfer the “must” (or what will be your final mead) into a new container from the “lees” (the crap that will make the taste of your drink go off). This process is known as “racking” and is usually done with a siphon tube. This will likely leave a bit more honey flavor with the slight fruit flavor, as the yeasts will go after the fruit sugars, leaving more honey behind at the end. If you’re only letting it ferment for a couple of weeks, then you’ll want to do it this way, since you won’t likely be doing multiple fermentations. The second is to add the fruit after the first (or subsequent) rackings. This imparts more of the flavor of the fruit on the finished product. The later you add it, the sweeter a flavor you’ll get, and keep in mind that when it comes to alcoholic drinks, “fruity” doesn’t necessarily mean “sweet,” as the fermentation process eats most of the sugar (the result with “fruity” stuff is that you’re left with the fruit taste, minus the sweet, kind of like how cacao and coffee can be considered “fruity” even though they are not naturally sweet). This is more for actual honey wine (which is what mead is), which is a 9-12 month process. If you enjoy wines or other higher alcohol drinks, it’s well worth it, in my opinion. Thank you Sandra 🙂 That’s wonderful about your bees! How ideal, to care for a hive and harvest your own honey for this (and lots of other goodies). How long do you think you’ll have to wait to get honey? I have no idea how beekeeping works. I hope I have bees one day. And goats. Thanks for checking out the post! Seems like a very fall/winter kind of beverage, too! I think so. My Czech friend (one of my taste testers) said she and her family used to drink it at Christmas back home. Brilliant! You’re a woman after my own heart. I’ll be making this by the end of the day. Thank you so much for breaking ground and sharing your experience. Thank you 🙂 That’s wonderful I’ve inspired you to try it! I hope you like it. I’m almost out and will get another batch going tonight too. Like most ferments, it’s incredibly easy. I hope you and your husband like it. I started a new batch last night too using the method I describe in the post, but you can also add a little bit from a previous batch if it’s still bubbly to give it a kick start. I’m assuming you like it so much, you’ll want to make more 🙂 Thanks for the comment. Cheers! If you’re the forgetful type like me, I recommend making an airlock for your jars. (If left closes, the jars can and will explode from the pressure.) Simply stretch the bottom lip of a large balloon over the mouth of it (the main body it left loose and floppy) and put a pinhole in the tip of the balloon’s main body. It will inflate somewhat, but will release air without letting in bugs of other nasties. I just started some. I’ll be so excited if I can stop buying wine, and make mead instead. I already can trade soap for honey. I never thought I would become a home brewer of anything alcoholic, and like you, I’m really excited. I LOVE that you can trade soap for honey! That’s brilliant. I would love to barter like that. I am training my friends to ferment in a small workshop next week and hope if I get them all hooked on it, we’ll create a small community of fermentos for sharing starters. My Mead has a bit of mold that grew on the inside… Thoughts? It might be the lees Jennifer. Mine has a beige blob floating around on top. It looks strange but it’s not mold. I hope that’s what you have. I hope your next batch goes better. I have had many learning experiences fermenting! Hi! I wanted to ask what happens if i leave the jar open the entire time? I have an awesome, big, old jar but I have no fitting lid..
Hi! I haven’t tried the open fermentation yet but i have a question about the batch i made in a flip top bottle. I mixed it about a month ago, june 28th i think. And all went like you described here. Sadly we didn’t finish it before we went on vacation for two weeks but i thought it wouldn’t matter if it fermented for longer. I put the lid on top but didn’t secure it so gas could escape without letting anything in. But now some sort of white slime floats on top. It doesn’t smell bad and it actually looks much like my kombucha scoby so maybe it’s something like that? Would it he okay to double the batch? Have you tried it? And if not double maybe like 1.5 times the amount. Would it be okay to double the batch? Have you tried it? Oh sure! I’ve doubled it. Enjoy! Making mead scales up very, very easily. I’ve got about two gallons brewing right now, and I have friends who make “single” batches in 5-gallon carboys (big jugs like what you see on water coolers). You’re really only limited by the amount of honey you can get your hands on and the size or amount of the containers you have. I don’t drink alcohol but my wife does. I’ll need to try this to surprise her with. Do you think I could throw in a black tea bag to flavor this? I am planning on making this today. I googled this and it says mead is ready after about three months. You say you can enjoy your “young” mead after 14 days. Is 14 days enough time for enough alcohol to form to get people buzzed or drunk? Thanks so much for replying! I’m late in starting my mead. I want to do it tonight. I hope it turns out well. I’ll be bringing it along for a vacation with my partner. I’m hoping i don’t poison us but i’ve done some reading and apparently we should be fine. Nawww, fermentation is very safe. The bad microbes, if they make it in there, get crowded out and die. p.s I’m a light weight too! That’s a hornet, not a bee. Much more aggressive creature. I’m off to the kitchen to give this a try.